I will explain to Mr. Roosevelt how my brother died fighting for his Country and how his country has repaid his poor widowed mother for the sacrifice. 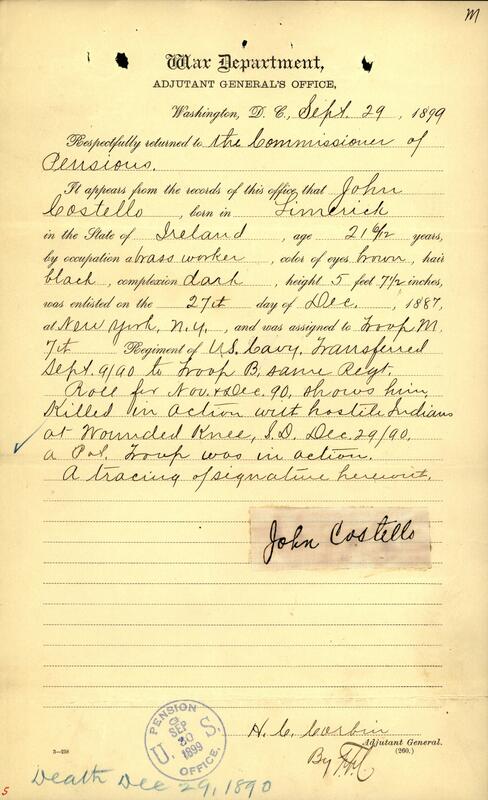 The War Department provided the Commissioner of Pension’s a tracing of John Costello’s signature in 1899. While most of the casualties in Captain Varnum’s B Troop likely occurred during the initial melee surrounding the council circle, Private John Costello, a twenty-one-year-old Irish immigrant from Brooklyn, New York, was killed in subsequent actions in the adjacent ravine. According to a casualty list posted in the Omaha Daily Bee, Costello was shot in the head. Several weeks after Wounded Knee, an unnamed soldier in B Troop described to Dent H. Robert, special correspondent to the St. Louis Post Dispatch, his recollection of an Indian killed on the field shortly after shooting Costello in the ravine. I saw that fellow [the Indian] shot. He had a good safe place in the end of that water cut and when we were charging up the ravine, he sat there picking us off. Lieut. John Gresham of our troop, ‘Johnny,’ we call him, was riding along the edge of the ravine with his revolver at a ‘raise pistol.’ The Indian had fired on us twice and, just as we came near him he fired again and shot John Costello dead. Just then Johnny lowered his revolver and fired, and Mr. Indian keeled over. Johnny got him just in time, for I had a bead on him, and a moment later I’d have had him. (Click to enlarge) This birth certificate submitted to the Commissioner of Pensions shows that Costello’s first name was actually Augustine and that he was only eighteen at the time of his enlistment. Born Augustine Paul Costello at Ballinstona, Limerick, Ireland on 27 June 1869, he was the eldest child of Michael W. and Bridget Costello. Michael was a farmer near the town of Kilmallock in county Limerick. At twenty-eight he married a thirty-year-old widow, Bridget Creed, daughter of John Duhig. Bridget had a daughter, Mary Agnes, from her first marriage and with Michael had six or seven children, all born in county Limerick, Ireland. After Augustine came Johanna Mary, born in 1870; another daughter, Gertrude, was born in 1871; Thomas John was born in 1872; another son, Michael, was born about 1878; and the youngest son, Thomas, was born in 1882. Likely the elder Thomas had died before the younger was born. Michael Costello, sold the family farm, which Bridget had inherited from her first husband, James Creed, and purchased second class tickets on the Red Star Line SS Wyoming bound for America. The Costello family arrived in New York Harbor on 22 November 1882 and settled in Brooklyn where the father worked as a clerk. (Click to enlarge) Record from the War Department to the Commissioner of Pensions detailing the service of Private John Costello. Augustine, or Gus as he was known to friends, enlisted at the age of eighteen two days after Christmas, 1887. Regarding his decision to join the army, a neighbor stated, “His father use to ill treat the soldier, Augustine, and he ran away from home and enlisted under the name of John Costello and induced my brother to enlist with him.” Costello not only enlisted under a false name, but also indicated he was twenty-one, thus avoiding the enlistment requirement for permission from a parent or guardian, not an uncommon practice among soldiers of that period. Costello indicated that he was a brass worker, and the recruiter annotated that he had brown eyes, black hair, a dark complexion and stood just under five feet eight inches. Initially he was assigned to M Troop and later transferred to B Troop in September 1890. Following his death, Captain Varnum inventoried Costello’s personal effects, and as was customary, sold them to other soldiers in the troop, the proceeds documented, turned over to the paymaster, and remitted to the War Department. In addition to the $14.65 collected for the sale of his effects, the government also owed him $33.64 for clothing not drawn. Costello’s father filed a claim the following year and collected the $48. 29 that was the net worth of his son’s estate. Michael died in 1895, leaving his widow, Bridget, destitute and living with her daughter, Gertrude, and son, Thomas. She initially filed for a pension in 1899 for her son’s service related death, but because he had given a false name and age at the time of his enlistment her claim languished in governmental bureaucracy. It was finally settled six years later only after Gertrude wrote to the War Department expressing her mother’s exasperation at not being able to settle the claim for Private Costello’s pension. My mother (Mrs. Bridget Costello) has been applying for a pension for the death of her son, John Costello, who was killed in the battle of Wounded Knee Creek in 1890. She has been trying for this pension now about seven years and is no nearer getting it now than when she first applied. The War Dept. is now asking for evidence that was furnished four years ago, and was sent on by Lawyer A. C. McNulty who had the case in charge at that time. We have sent on the Baptismal papers called for also my mothers marriage certificate which ought to be positive proof that she and the soldier were mother and son. Now the question is, if the war department doubts this fact now, why did it recognize her as his mother at the time of his death when she made a claim for his effects, and received seventy-two dollars for which his effects had been sold. My mother is dependent upon me for her support and as I am going to be married in a few months and will then not be in a position to help her as I am unfortunately not marrying a millionaire. She will probably have to seek some home. Now I am going to submit this case to the President as I think it is carried on with entirely too much red tape. It is very queer how some can get it with so little trouble and all the time we have had to wait. I will explain to Mr. Roosevelt how my brother died fighting for his Country and how his country has repaid his poor widowed mother for the sacrifice. You are at perfect liberty to criticize me for this action as you wish. 4712 3rd Ave Brooklyn, N.Y.
Bridget Costello finally began receiving the $12 a month pension seven months later, but only after several more depositions and letters attesting that her son, Augustine, was in fact Private John Costello. John Costello’s sister, Johanna, and brother Michael, who did emigrate from Ireland with the family were no longer living at the time that Bridget Costello applied for her son’s pension and likely predeceased the cavalry trooper. The youngest brother, Thomas, was a bachelor living in Brooklyn with his mother and sister, Gertrude, in 1910, but traces of him disappear after that. Gertrude, never married and died in 1914. The eldest sister from Bridget’s first marriage, Mary Agnes Creed, married Harry A. Klein in Manhattan in 1890, and provided Bridget with her only grandchildren. Bridget Costello died 4 June 1924 in Brooklyn. Like his fellow comrades that fell at Wounded Knee, Private Costello was initially buried on New Year’s Eve, 1890 in the Episcopal Cemetery at the Pine Ridge Agency. His remains were removed in October 1906 and re-interred at Fort Riley. John Costello’s name appears on the second face of the Wounded Knee Monument at Fort Riley. 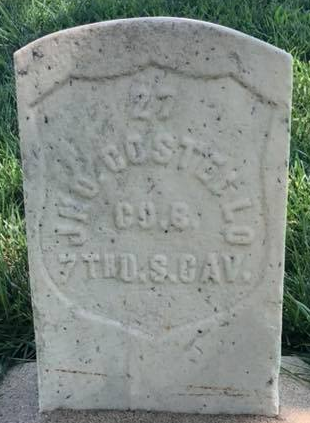 Private John Costello, Company B, 7th U. S. Cavalry, is buried in the Fort Riley Post Cemetery. Adjutant General’s Office, Letter to Commissioner of Pensions dated 29 Sep 1899, The National Archives, Registration of Births and Deaths in Ireland: Augustine Paul Costello, The National Archives, Pension Application Certificate No. : 598497, Pensioner: Bridget Costello, Case No. : 50560, Bundle No. 16, hereafter cited as “Pension Application of Bridget Costello.” Research conducted by Vonnie S. Zullo of The Horse Soldier Research Service. Associated Press, Omaha Daily Bee, January 01, 1891, Part One, Image 1, http://chroniclingamerica.loc.gov/lccn/sn99021999/1891-01-01/ed-1/seq-1/ accessed 4 Nov 2013. Dent H. Robert, “On the Wounded Knee Field,” St. Louis Post-Dispatch (St. Louis, Mo: 26 Jan 1891), 2. 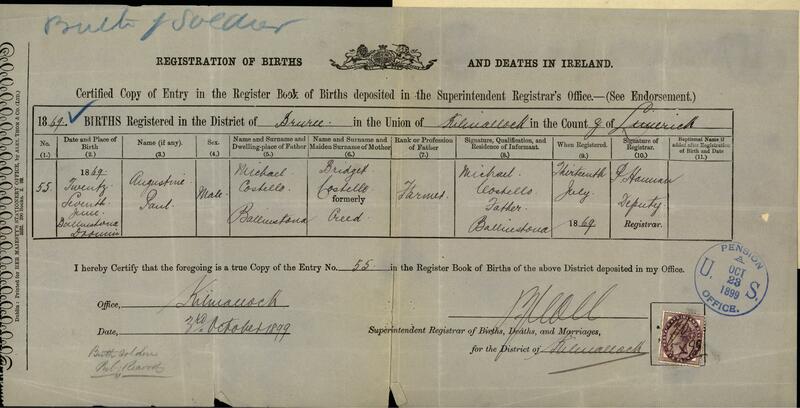 Registration of Births and Deaths in Ireland: Augustine Paul Costello, Pension Application of Bridget Costello. Ancestry.com, Ireland, Civil Registration Marriages Index, 1845-1958 [database on-line], Provo, UT, USA: Ancestry.com Operations, Inc., 2011, Original data:“Ireland, Civil Registration Indexes 1845–1958,” Index, FamilySearch, Salt Lake City, Utah. General Register Office, “Quarterly Returns of Births in Ireland with Index to Births,” Belfast, Ireland, Volume: 5, Page Number: 414, FHL Film Number: 101250; Ireland, Births and Baptisms, 1620-1911, FHL Film Number: 101194, 101214, 255838, and 255866; New York, State Census, 1892, Residence Place: Brooklyn, Kings, Ward: Ward 08, Election District: 20; Ancestry.com, New York, Passenger Lists, 1820-1957[database on-line], Provo, UT, USA: Ancestry.com Operations, Inc., 2010, Year: 1882, Arrival: New York, New York, Microfilm Serial: M237, Microfilm Roll: 459, Line: 3, List Number: 1638; Personal messages to the author from Mrs. Jenny Creed, dated 22 Jan 2014 and Mr. Eugene Klein, dated 24 Jan 2014. Augustus Heintz, “Deposition for Pension Claimant Bridget Costello dated 19 Sep 1905,” Pension Application of Bridget Costello. Pension Application of Bridget Costello. Adjutant General’s Officer, “7th Cavalry, Troop B, Jan. 1885 – Dec. 1897,” Muster Rolls of Regular Army Organizations, 1784 – Oct. 31, 1912, Record Group 94, (Washington: National Archives Record Administration); Adjutant General’s Office, Final Statements, compiled 1862-1899, (Washington: National Archives Record Administration), http://www.fold3.com/document/271303414/ accessed 21 Dec 2013; Pension Application of Bridget Costello. Gertrude V. Costello, “Letter to Secretary of War dated 21 Feb 1905,” Pension Application of Bridget Costello. James Mooney, The Ghost-Dance Religion and the Sioux Outbreak of 1890, (Washington: Government Printing Office, 1896), 871-872. Pension Application of Bridget Costello; Ancestry.com, United States Federal Census [database on-line], Provo, UT, USA: Ancestry.com Operations Inc, 2004, Year: 1900, Census Place: Brooklyn Ward 8, Kings, New York, Roll: 1047, Page: 1B, Enumeration District: 0104, FHL microfilm: 1241047, Year: 1910, Census Place: Brooklyn Ward 8, Kings, New York, Roll: T624_959, Page: 25A, Enumeration District: 0150, FHL microfilm: 1374972; Ancestry.com, New York, New York, Marriage Indexes 1866-1937 [database on-line], Provo, UT, USA: Ancestry.com Operations, Inc., 2014, Certificate Number: 7586. Samuel L. Russell, photo., taken 25 Aug 2018; Associated Press, (1893, July 27), “Wounded Knee Heroes,” Abilene Weekly Reflector, X (48), p. 5. Citation for this article: Samuel L. Russell, “Private John Costello, B Troop, 7th Cavalry – Killed in Action,” Army at Wounded Knee(Carlisle, PA: Russell Martial Research, 2015-2016, http://wp.me/p3NoJy-h7) updated 17 Nov 2016, accessed date __________. This entry was posted in Casualties, Enlisted and tagged 1890, 7th Cavalry, 7th Cavalry Regiment (United States), Cavalry, Fort Riley, Killed in Action, Lakota, Miniconjou, Oglala Lakota, Pine Ridge, Pine Ridge Agency, Pine Ridge Indian Reservation, Sioux, Wounded Knee, Wounded Knee Creek, Wounded Knee Massacre. Bookmark the permalink. A little additional information on Gus Costello: the whole clan arrived in NYC 22 Nov. 1882 on the SS Wyoming (FHL film 1027029-30, NY Passenger Lists, Oct. – Dec. 1882) rich enough to be in a second class cabin. My father, Eugene Klein, remembered his mother, Mary Creed, telling the story of a relative killed at Wounded Knee, but he did not have the relationship or name. “John’s” name did not make it into the New York Times accounts I found back in the early 1990’s, so his fate was a family mystery, until now. Thank you. Michael Costello’s selling the family farm that quite possibly had been in the Creed family for generations would explain how the Costello family were able to afford second class tickets on the Red Star Line SS Wyoming when they immigrated to America.